George David Lytle was born in New York in 1857 and came to Topeka in 1889 when he was 32. He was only in Topeka a short before he left for southern Kansas where he worked in the oil industry in Wichita, Independence, and other Kansas towns. He returned to Topeka in 1905 where he began investing in the city, buying properties and revitalizing blighted areas. In 1906, Lytle established a neighborhood a block from the Governor’s Mansion at 8th and Buchanan. 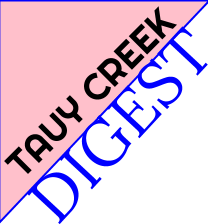 His plan was to create an upscale neighborhood with big houses costing at least $2,000. edition of the Topeka Daily Capital. West Lawn was advertised in the Topeka Daily Capital in early 1907 and offered a roomy completed house complete with papered walls and finished walks all on two lots. West Lawn extended from 8th to 10th Streets and was on both sides of Lane Street. Lytle himself even had a house in West Lawn that he also used as an office and model home. Lytle also owned a farm northeast of Topeka. Lytle would not see what West Lawn would ultimately become however. Lytle became sick with typhoid in mid-August 1909. It was assumed that he was getting better but, after a cheerful and upbeat conversation with his wife, died unexpectedly of an internal hemorrhage on September 6, 1909. 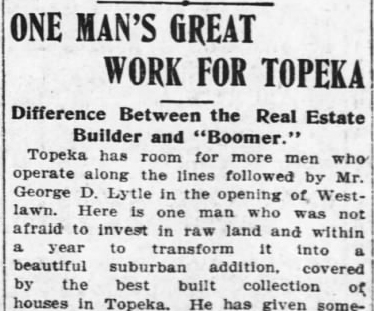 A later column in the Topeka Daily Capital estimated at Lytle built over 200 houses in Topeka and that much of Topeka’s growth was owed to Lytle and his crowning achievement was West Lawn. George David Lytle was buried in Topeka Cemetery underneath a beautiful stone with “Builder of West Lawn” engraved on it. George Lytle gravestone in Topeka Cemetery. West Lawn, when completed probably about 1915, had about 36 houses. Today, only two remain. Over the years, the nearby hospital, Stormont Vail, has expanded and grown into the West Lawn neighborhood. In the 1950s or 1960s, an apartment complex was built in the 800 block of Lane, it was torn down just recently. Most of the west side of West Lawn is a parking lot for Stormont Vail and nearby medical offices, the east side consists of a branch of Family Guidance Counseling, a prosthetics company and abandoned bank, and a newly built medical building. The two houses are located in the southeast corner or 9th & Lane, the last remnant of a neighborhood that George Lytle, and at one time all of Topeka, were so proud of. 904 Lane, built approximately 1910. 900 Lane, built approximately 1910. Hanger Prosthetics and abandoned UMB Bank, built approximately 1980. West side of the 800 block of Lane Street. West side of the 900 block of Lane Street. 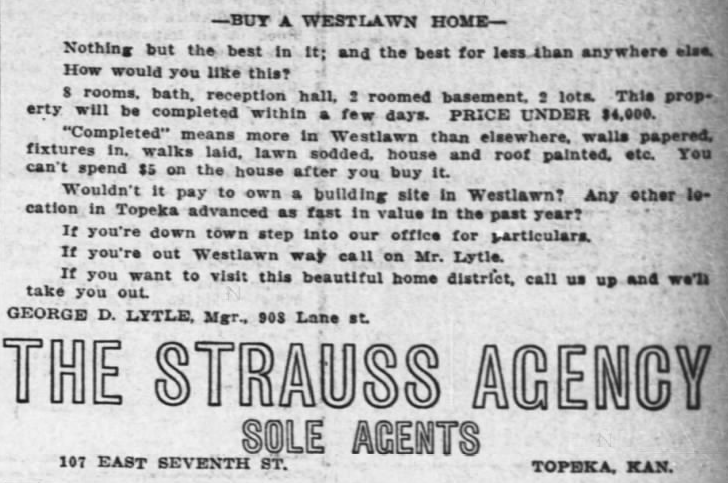 Article on Lytle and West Lawn in the Topeka Daily Capital, May 19, 1907.